Who invented the Abacus? The name of a specific person has never been credited with the invention of the Abacus but the first such device was believed to have been invented by the Ancient Mesopotamians c.2700–2300 BC. There is a common belief that the Chinese invented the Abacus but the first Chinese Abacus was invented c. 500 B.C. and was further developed during China's Middle Ages, during the Ming Dynasty (1368-1644). Definition of the Abacus: The Abacus is defined as an ancient calculator that was used as a mechanical counting device to keep track of numbers. The Abacus was a wooden frame that was mounted with horizontal rows of rods, along which moveable small stones, pebbles or beads (counters) were slid. The lowest line represented units, the second line, tens, the third line hundreds etc. Over time the use of the Abacus became more sophisticated and by separating groups of beads it was used not only to perform addition and subtraction but also to perform multiplication and division. Fact 1: Who invented the Abacus? The name of the inventor of the Abacus is unknown but it is believed to have been invented in c.2700–2300 BC by the ancient Mesopotamians of Sumeria. Fact 2: Who invented the Abacus? Prior to the invention of the Abacus c.2700 - 2300 BC, the Mesopotamians were credited with the development of Math c. 3500 BC when the ancient Mesopotamians assigned symbols to groups of objects to make the description of larger numbers easier. Fact 3: Who invented the Abacus? The Mesopotamian civilization had developed complex lifestyles living in large cities with centralized economies, and needed to control what was being produced and the distribution of resources. Fact 4: Who invented Math? As the cities and their economies grew larger it became impossible to keep count of all the amounts of all the grain, cattle and sheep entering or leaving the neighboring farms and the grain stores. Fact 5: Who invented the Abacus? The Mesopotamians needed to develop a fast counting system to keep track of numbers which led to the invention of the device now known as the Abacus. Fact 6: Who invented the Abacus? The word 'Abacus' derives from the Hebrew word 'Abaq' literally meaning "dust", in reference to sand or dust strewn on a surface for writing. The first Abacus was in the form of a drawing board covered with sand or dust on which mathematical calculations could be easily traced and erased. Fact 7: Who invented the Abacus? The reason for the Semitic source of the word was because the original home of the ancestors of the Hebrews was due north of Mesopotamia (Genesis 11; Acts 7:2). Fact 8: Who invented the Abacus? The 'sand table' was the predecessor of the Abacus on which a wooden frame was covered in sand or dust was used to make markings for calculation purposes. The Mesopotamians of Sumeria had developed the first form of writing called "Cuneiform" c.2700 that used wedge shaped marks to make picture symbols on clay tablets. It is therefore reasonable that they used a form of picture symbols to make their markings on sand tables. Fact 9: Who invented the Abacus? The 'sand table' method of counting required the drawing of symbols and this was soon replaced by adding objects, such as stones, for counting and then columns for a 'place-valued' form of math. Fact 10: Who invented the Abacus? The invention of the Abacus was a natural progression to the 'sand table'. Instead of using stones on sand the Mesopotamians invented a portable wooden frame that was mounted with horizontal rows of wooden rods, along which moveable small stones, pebbles or beads could be slid for addition and subtraction purposes. Fact 11: Who invented the Abacus? The Mesopotamians used sexagesimal number system with sixty as its base to represent value, quantity or numbers. Fact 12: Who invented the Abacus? The sexagesimal number system was also used in Mesopotamia to divide time into units of 60 that is still used to the present day for minutes and seconds. Fact 13: Who invented the Abacus? The Mesopotamian Abacus was a useful device for adding and subtracting but was difficult to use for more complex calculations. Fact 12: Who invented the Abacus? Over time knowledge of the calculating device spread to other civilizations such as the Ancient Egyptians, the Assyrians, the Persians, the Chinese, the Romans and the Greeks. These ancient civilizations developed the machine into a more expensive and sophisticated device using marble frames and disks and metal counters instead of stones and pebbles. Fact 14: Who invented the Abacus? The Roman numeral system used units of fives, tens, hundreds etc and marked lines were marked on the board, the wooden rods were replaced by wires with moveable beads. These adaptations resulted in a machine that was much faster to use. Fact 15: Who invented the Abacus? 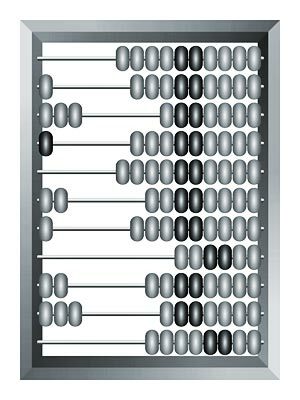 The Chinese abacus, known as the 'Suan Pan' meaning "Counting tray" was invented around 500 B.C. and was further developed during China's Middle Ages, during the Ming Dynasty (1368-1644). The 'Suan Pan' abacus was developed for not only for addition and subtraction purposes but also for multiplication and division calculations. Fact 16: Who invented the Abacus? The invention of the ancient abacus was gradually replaced by the manually-operated calculating device called Napier's bones, the slide rule, the "calculating clock" and eventually the Mechanical Calculator that was invented by Blaise Pascal in 1642. Other forms of machines were developed over many years such as the electric desktop calculator, the transistorised desktop calculator on to the portable handheld devices, solar powered devices and finally the first hand held computers. Fact 17: Who invented the Abacus? Despite the new technology forms of the ancient abacus counting machines are still in use today and the simple counting board is used in some elementary schools to help teach children math. Fact 19: Who invented the Abacus? In 1962 Tim Cranmer (1925-2001), invented the Cranmer abacus for the use of the blind and sight impaired people. In the Cranmer abacus a piece rubber or soft fabric is placed behind the counting beads so that they do not move inadvertently. Who Invented the Abacus? - Unknown Mesopotamian Inventor - Invention - Definition - Meaning - Famous - Device - Innovation - Significant - Mesopotamian Development - Mathematics - Math = First - Definition - History - Timeline - Kids - Facts - Information - Info - Dates - When - Why - Impact - Purpose - Use - New - Old - Definition - Meaning - Awesome - Cool - Mesopotamian - History - Timeline - Who invented the Abacus?